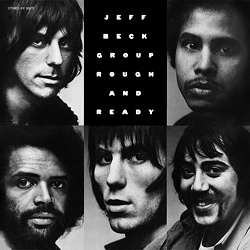 ﻿Great talent and low morals well describes the groupie-loving and colleague-killing Jeff Beck - and no fear of denial! But this fast-paced life demanded its toll, which came in the form of a life-threatening car accident. The ace on the guitar was forced to retire for two years but returned to the scene full of vigour and with new musicians to launch the second Jeff Beck Group. "Rough And Ready" doesn't offer what might be expected from Brit Rock as far as a heavy sound or the boss's egomaniacal leaps on the guitar strings are concerned. Bob Tench opens the album with a surprisingly soulful sound and soaring falsetto in "Get The Feeling". But then in the next number, "Situation", we have crackling fire from the lead guitar and inventive solos - all easy-going and down-to-earth. Beck wouldn't tolerate routine rock: this is obvious from "Max's Tune", in which developing melodies are hacked to pieces by the clash of cymbals. To round off the album, the band sings about "Jody" with constantly varying rhythms and fascinating harmonic twists, which genially and firmly find their way along the narrow path between sentiment and testosterone. So much roughness is a must!